Skyler Lentz. Looking for a Better Way to Treat Hypoxia in the Emergency Department? Reach for High-Flow Nasal Cannula. emdocs.net. Brady Scott. High Flow Nasal Cannula: Where are we now?. AARC 2018. Thomas Lettich. High Flow Nasal Cannula (HFNC) – Part 1: How It Works. REBELEM. Thomas Lettich. High Flow Nasal Cannula (HFNC) – Part 2: Adult & Pediatric Indications. REBELEM. Nishimura M. High-Flow Nasal Cannula Oxygen Therapy in Adults: Physiological Benefits, Indication, Clinical Benefits, and Adverse Effects. Respir Care 2016. Frat JP. High-flow oxygen through nasal cannula in acute hypoxemic respiratory failure. FLORALI. New England Journal of Medicine 2015. Franklin D. A Randomized Trial of High-Flow Oxygen Therapy in Infants with Bronchiolitis. PARIS. New England Journal of Medicine. 2018. Doshi P. High-Velocity Nasal Insufflation in the Treatment of Respiratory Failure: A Randomized Clinical Trial. Annals of Emergency Medicine 2018. High-flow nasal cannulae for breathing support in adult intensive care patients. Cochrane Collaboration 2017. High-flow nasal cannula (tube) therapy for infants with bronchiolitis. Cochrane Collaboration 2014. Hernandez G. High-flow nasal cannula support therapy: new insights and improving performance. Critical Care 2017.
failure: ready for prime time yet?. Journal of Emergency and Critical Care Medicine 2017. Helviz Y. A Systematic Review of the High-flow Nasal Cannula for Adult Patients. Critical Care 2018. Josh Farkas. 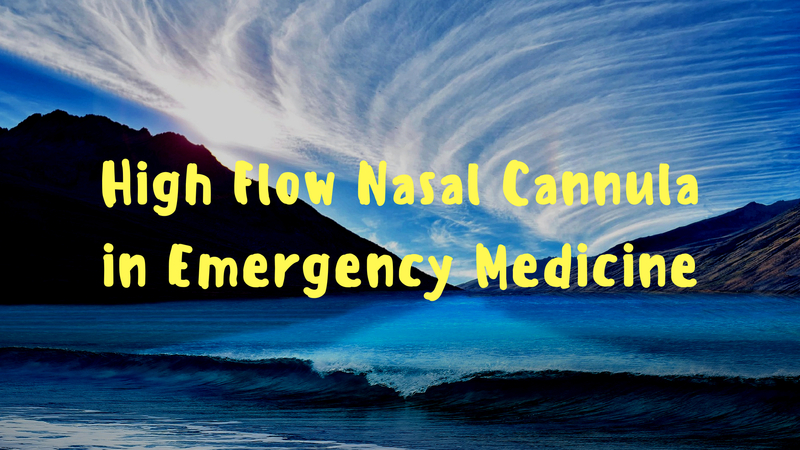 PulmCrit- Does the HIGH trial debunk high-flow nasal cannula?. emcrit. Cabrera. High Flow Nasal Cannula in the ED. [Spanish]. ConceptosUC 18. Frat JP. Non-invasive ventilation versus high-flow nasal cannula oxygen therapy with apnoeic oxygenation for preoxygenation before intubation of patients with acute hypoxaemic respiratory failure: a randomised, multicentre, open-label trial. Lancet Respir Med. 2019 Apr;7(4):303-312.